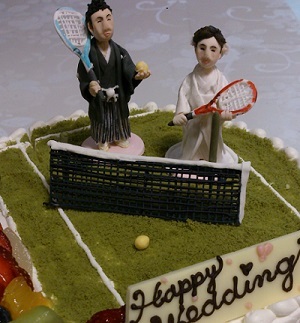 The cake decorated with sugar crafted figures in kimono was prepared for the groom who loves tennis. They can be reserved semi permanently. Both family members also liked the idea very much. Both looks great in Kimono. The furisode (kimono) Mitsuyo-sama is wearing was a present from her grandmother for her Seijinshiki (coming-of-age ceremony). Everyone enjoyed the delicious meals and beautiful garden. Congratulations on your wedding, Toshiyuki-sama & Mitsuyo-sama. They got married at Kamigamo shrine and had a wedding banquet at Saami (ryotei restaurant) today. They have deepened their love despite living far away each other for 10 years; one in Kanto and the other one in Kansai. 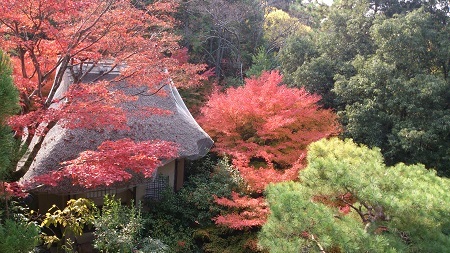 Mitsuyo-sama gave a surprise present to Toshiyuki-sama. During the banquet, both sides of family enjoyed the conversation and spent good time watching the album the bride & groom prepared. We are so happy that we could help arranging this wedding for such a nice couple. We wish you much love and happiness!